After the founding of Penang by Captain Francis Light of the British East India Company in 1786, Penang became a magnet for many Chinese who left China seeking their fame and fortune. These imigrants came from various districts and villages in China and upon arriving in a new strangy country , usually banded together into clans . There were 5 such clans in Penang and one of them was the Khoo clan and it is to them that we owe a debt of thanks for building the incredibly beautiful Khoo Clan house in George Town . The khoo’s originally came from Sin Aun Village in Xing Lin District, Xing Lin Town, Amoy (Xiamen) and the first documented account of one of its members was Khoo Mo Liu, a 14th generation descendant of Chneh Pang. Born in 1752, he died and was buried on the island in 1795. By 1816, the Khoo population in Penang was around 100. Most of who were enterprising traders and established businessmen. 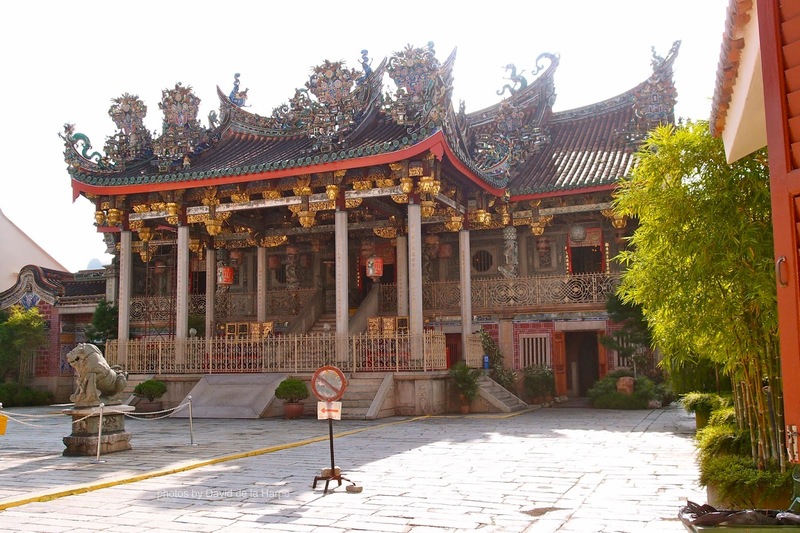 When the Cheng Soon Keong temple of their home village in China needed funds for restoration, they donated 120 Dollars in the name of the “Penang Tua Sai Yah Public Fund” and soon after the members decided to build their own clan house or Kongsi as it is locally known. In 1850, they purchased a block of land from an Englishmen and converted the existing house into a clan house. It was named Leong San Tong and was used for gatherings, ancestral worship and weddings. A few years later, the Board of Trustees built a block of office buildings on the vacant lot of the courtyard to house a conference and administration hall. With the respective clan houses as the nuclei, these kongsi demarcated their territories with their own terrace houses on three or four sides of the perimeters. This adjoining, closely-knit and defensive model settlement, like a clan village in the colonial city, is a rare form of congregation practiced among migrant communities. Today this secluded and defensive sort of construction is very visible as you leave Canon Street and walk through the gates into the settlement. Half a century later (1894), with many of the clan members now wealthy businessmen of Penang, the board of trusties decided to demolish the old clan house and build a new one using master craftsmen from Southern Fujian. It took eight years to complete this new clan house but unfortunately, the magnificent building was almost completely razed by fire on Chinese New Year’s Eve in 1901. The loss of the grand clan house was a painful blow for the clan, but they decided to reconstruct the clan house from scratch in 1902 and it took them 4 years to complete. The two constructions spanned thirteen years and cost more than one hundred thousand dollars each. The Leong San Tong we see standing today is the one completed in 1906. It was partially damaged in World War II when the Japanese bombed George Town however repair works were done to fully reinstate the clan house to its former glory in 1958. Main hall of the ancestrial temple. 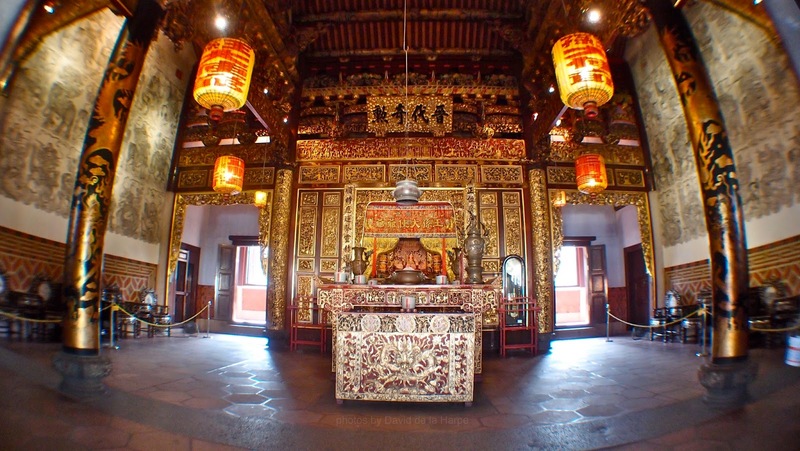 The Khoo Kongsi has to be one of the finest examples of Chinese architecture in Malaysia . The entire building is covered with intricate tiled shard work, mural paintings, wood and stone carvings many of which have been gilded in gold leaf. It is a not to be missed attraction on the Penang Heritage trail. Open Daily from: 09:00 am to 5.00 pm. Entrance fee: RM10.00 per person.